Nev has a successful 35+ year history in the surf industry and is recognized as one of the best shapers in the world. Working closely with Taj Burrow over the past 4+ years, Nev has been instrumental in developing Future Shapes Technology and designing equipment perfectly suited to Taj's needs. Taj's results on the 2007 WCT were his best in years and speak volumes about Nev's understanding of surfboard design and the pure performance potential of Firewire Surfboards. While Nev has considerable shaping expertise, due to the sophistication of our computerized design programs and shaping equipment, we prefer to call him a Designer. Drawing on his actual shaping expertise and combining it with the unlimited design capabilities of Firewire's CAD/CAM platform, Nev has the tools to take surfboard design into the next frontier, a place where materials have as important an influence on performance as proven design principles. In fact, we believe that just like the influence that Future Shapes Technology has already had on surfboard performance, the next quantum leaps forward will be centered around completely new materials and how those materials allow us to re-tweak longstanding beliefs surrounding shape. To that end, Direct Drive and more recently RapidFIRE reflect those beliefs. Firewire Surfboards use epoxy resin and EPS foam, materials that are exponentially less harmful than traditional surfboard materials. Over a 5–year lifespan, including the construction process, a traditional PU surfboard releases 50 times more Volatile Organic Compounds (VOC’s) than a Firewire surfboard. 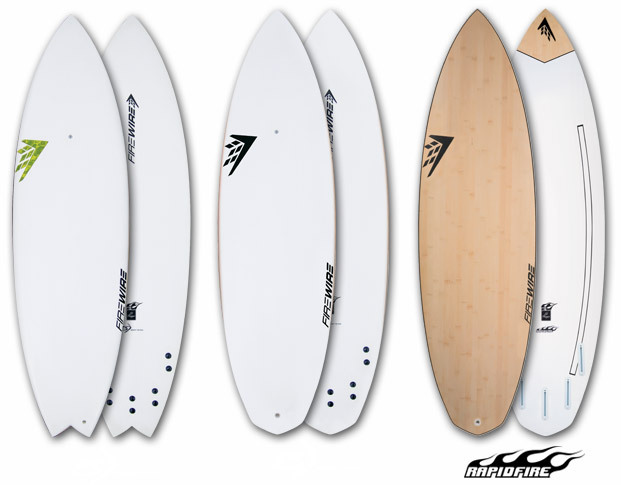 In recognition of this, Firewire Surfboards won the coveted EuroSIMA Environmental Product of the Year Award in 2005. And we’re not resting there. Ultimately our goal is to constantly improve the sustainable manufacture of our surfboards. The end point being the design and production of a surfboard that can be recycled indefinitely by reusing old boards to make future Firewire Surfboards. Granted, we are a long way from that lofty goal, but it is a standard we have set for ourselves. Firewire boards are lighter and stronger than traditional PU surfboards and much of that weight saving and strength comes from our proprietary blank construction. Unlike regular polyurethane cores, which weigh 2.5 - 3lb per cubic foot, the FUTURE SHAPES TECHNOLOGY (FST) and DIRECT DRIVE (DD) cores are built from 1lb EPS foam. A 3mm layer of high density aerospace composite is added through a vacuum process to stabilize the core and increase strength. The end result is an incredibly light weight and durable blank unique to Firewire. EPS Foam Core: Firewire is 100% committed to EPS (Expanded Polystyrene) for our shaped cores. Not only is this material infinitely more environmentally friendly than PU (polyurethane) foam, but the excess EPS material is recycled. In addition, the 1lb core is an essential part of Firewire’s high performance. The way in which materials travel through different mediums is a direct result of their density AND shape. For example, a baseball and tennis ball are roughly the same shape and size, but behave completely differently when thrown. Similarly, a 1lb foam core allows for rapid direction changes and overall responsiveness during rail–to–rail turns. Corecell Skin: Corecell is an amazing material with an extremely high strength to weight ratio. One of its primary uses is in wind turbine blades, which gives you an idea of its durability. It is flexible and has very high impact strength with very little material fatigue over time. Unlike traditional PU foam boards, Firewire blanks are not only lighter weight and stronger, but the flex characteristics remain intact for a considerable amount of time, long after traditional blank materials have fatigued and lost their spring. Epoxy Resins: Firewire boards are built with epoxy resins, which are not only far stronger than polyurethane based resins, but emit only 2% of the VOC’s (volatile organic compounds) versus regular PU resin. Unlike a PU based laminating facility, you can walk anywhere in the Firewire factory without a mask and without a headache. Furthermore clean up requires simple citrus cleaners. Balsa Wood Rails: The specific construction and choice of balsa for the rails is vital to Firewire’s flex characteristics and performance. While the balsa looks like a thin veneer on a completed surfboard, in fact it is over half an inch thick, built from 3 x 4mm strips laminated together and running the length of the surfboard perimeter, creating an incredibly lightweight, durable structure and incidentally a great buffer for those inevitable rail bashes when surfing. The balsa ensures that the degree AND rate of flex is controlled to maximize performance. How did you discover Firewire? I saw the article in Surfing about the shaper of the year, about Bert Burger and became very interested. With Taj on them, it also gave them full street cred, then when Cheron brought them in I had to try 'em out. Can you share a story where you were blown away by your board, like a manoeuvre, or a contest result? My go-to board was the 6'2" swallow tail alternator (I'm a fairly staunch bugger) - surfed it in the Xcel Supertubes showdown and pulled of the best move, which won me a new Firewire. I took the 6'2" rounded pin flexfire direct drive as prize and am now blown away by this board. I can push it really hard in good waves and it responds well. I’m trying to get people to understand that boards made out of foam can and will break under the right impact; do you have any broken board stories?